Coming up! 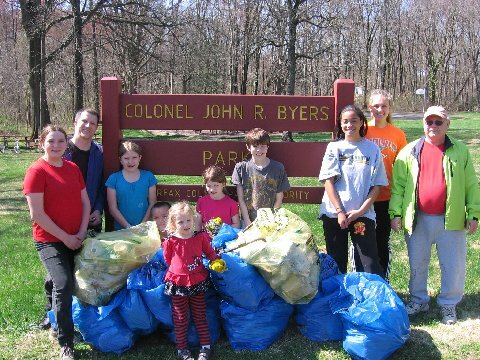 Little Hunting Cleanups will be held on April 14 and May 5, 2018, as part of the Potomac River Watershed Cleanup sponsored by Alice Ferguson Foundation. Community credit hours are provided for students who bring their forms. We supply gloves and sturdy plastic bags. Please join volunteers and neighbors from 9 a.m. to noon at sites in the neighborhoods that bound the creek. Some sites offer the rare opportunity to canoe or kayak on beautiful Little Hunting Creek. Don't miss the chance! Colonel John Byers Park. 2213 Collingwood Rd. (between Candlewood Dr. and Karl Rd, on the south side of Collingwood.) Meet at the playground area of the park and proceed along the creek to the beaver dam and beyond. Contact: Greg Crider. Gum Springs. Meet at 3200 Shaw Park Court to help clean up wooded parkland and marsh along the creek. Spring beauty, a native wildflower, will be blooming. Contact: Bryan Birch. 3101 Waterside Lane. Bring your canoe or kayak to pick up trash from the creek. 3102 McGeorge Terrace. Meet here to pick up trash in woods along a short, established trail through parkland along the creek. 8707 Stockton Parkway. Meet promptly at 8:30 a.m. to sail with the tide and collect trash from the water with the Stratford Armada. Bring your kayak or canoe and personal flotation device. Also bring your pirate dictionary, matey. Contact: Paul Siegel. 8610 Stockton Pkwy. Volunteers will pick up litter in the Northern Virginia Conservation Trust property, at the intersection of Stockton and Londonderry. Contact:Celia Boertlein. First River Farms. Contact: Mimi Friedman. Come help Senator Surovell and the Surovolunteers clean up the trashiest section of stream in Fairfax County! Pizza and water will be provided. Please respond here if you plan to come. Janna Lee Avenue Bridge. From the intersection of Route 1 and Mount Vernon Memorial Highway, turn west onto Buckman Rd.,right on Janna Lee Ave.,to the bridge over Little Hunting Creek. Mount Vernon Plaza.Meet next to the Sherwin Williams Paint Store at 7644 Fordson Rd. Sturdy waterproof shoes or rubber boots or old sneakers (most sites are muddy). Long pants and long sleeves (some sites have poison ivy). Water, and a hat or sun protection (some sites are exposed). Click here to see results of past cleanups in 2016, 2015, 2014, 2013, 2012, 2011, and 2010.